Money raised through fresh capital stood at its lowest level in 2017 since 2012. There is no denying that year 2017 saw a flood of initial public offers (IPOs) with 36 issues till date that has raised the highest ever amount of Rs 67,140.6 crore. But what comes as surprise is that only 17.4 per cent of this amount has been used for a firm's growth and expansion, rest all have gone to the promoters and other existing shareholders. A closer look at the break-up of the issues reveals that the share offer for sale mechanism dominates with 82.6 per cent - the highest share of this mechanism at least over a decade. With this share of fresh capital was restricted to just 17.4 per cent in 2017. 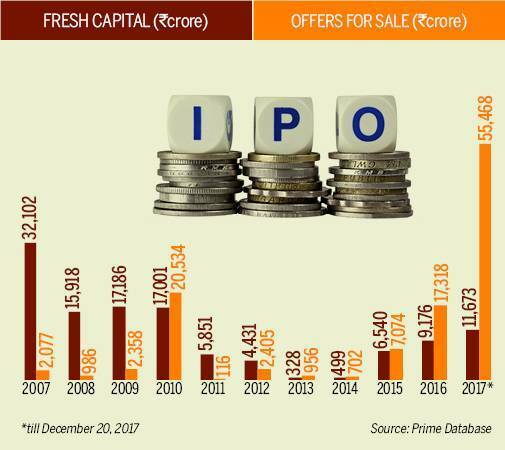 Money raised through fresh capital used to dominate the IPOs in most of the years before 2012 - the share was 98.1 per cent in 2011 but has been gradually declining since then and stood at its lowest level in 2017 (till date). Hope to see some revival next year with improving micro and macro numbers in the economy.